We would likely to express our deep appreciation to Suzanne Bolton and Jeff Mooney for their exceptional donation to create “The Gratitude Fund“. 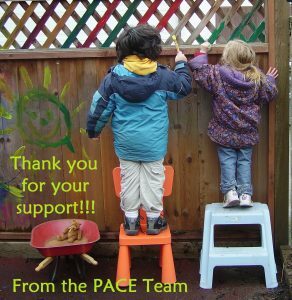 The Board and staff are extremely grateful for their long-term support and acknowledgement of the value of the programs and service delivery offered by PACE. We would like to acknowledge some of our friends over the years, and also thank those individuals who wish to have their contributions remain anonymous. Thank you to Native Northwest for their beautiful Indigenous-designed books and puppets. New Sunshine Coach! Thank you Variety – The Children’s Charity!